In the tradition of artists like Magritte and Richard Prince, Roberts often works with images and conventions recognizable from the media, reframing his appropriated source material to reveal the absurdity of every day life. While his visual language combines influences of modern and pop art, the artist’s sophisticated compositions provoke engagement rather than astonishment, inviting the viewer to consider the impact of visual media on the consumption of ideas in the Digital Age. Roberts’ introduction to art came largely through music and its influence can be seen throughout the development of his practice. In early work, the young artist transformed hi res photographs of black celebrity into impressionistic portraits of aspiration, softening the spotlight on his subjects both physically and conceptually. Borrowing from the visual culture of rap, Roberts then obscured their eyes with censor bars. By censoring his subjects’ vision, the artist transforms the aesthetic and intellectual appeal of the work in an arresting artistic gesture that renders a once easily consumable image, suddenly provocative and intriguing. In 2010, at a crucial moment in Roberts’ development as an artist, Kanye West released his fifth studio album. The cover art for My Beautiful Dark Twisted Fantasy featured the work of George Condo, introducing Roberts to Condo’s hysterically ghoulish characters. 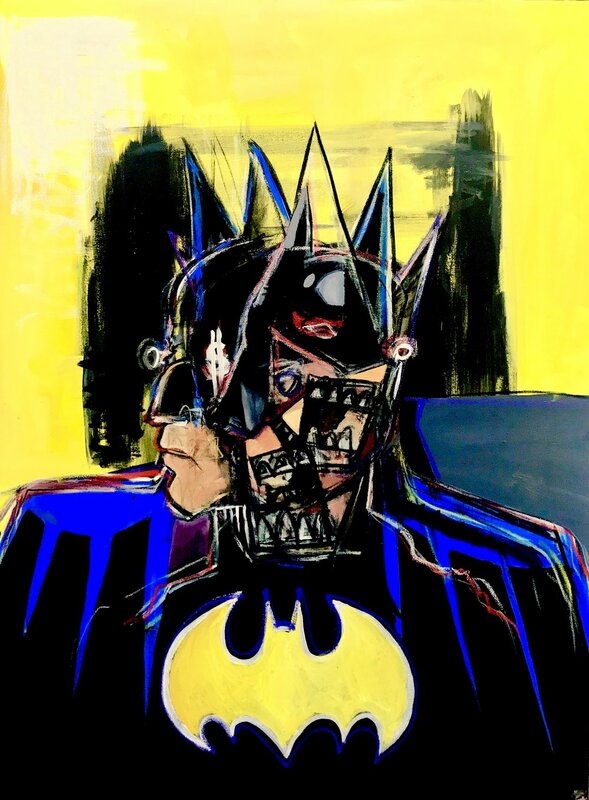 Inspired to pursue more sinister subject matter, the artist began breaking down images of notorious cultural icons into their basic geometric forms. He then reconstructs the picture, often allowing the geometric blue print of the figure to remain visible. Much like a musician develops sonic depth, Roberts achieves compositional intensity, rhythm, and harmony by arranging color, texture, and meaning over the structural outline of a given piece. Layering charged source imagery and cartoon extremities over the geometric x-ray of the work, Roberts’ process results in a kaleidoscopic Venn diagram of form and content. Today, headlines in hyperbole spew from constantly updating newsfeeds while global disasters compete for our dwindling attention spans on the daily. Addressing subjects like police brutality, exclusionary politics, and systemic racism, Roberts’ refined handling of formal content highlights the structural similarities between reality and caricature. By linking our deference to outrageous imagery to our acceptance of outrageous circumstances, the artist transforms paradoxically mundane images into revelatory meditations on the complexities involved in the mechanics of change.